In the last two newsletters I shared two very unique opportunities Part 1 and Part II to volunteer and serve others while on vacation (also known as Voluntourism) in Peru. Today I would like to share the experience of our final service project through GlobeAware that we participated in during our memorable trip to Peru. Thinking of our final days of service in Cusco just reminded me of how fortunate we are to have our children living with us. We have the means to provide an education to them and certainly have many opportunities to be proud of their accomplishments and talents as we attend soccer games, swim meets, award ceremonies, class plays, musical performances and concerts, dance recitals, etc. etc. We see their self-esteem and confidence flourish. 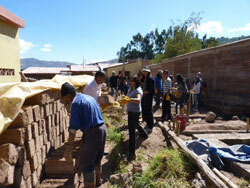 Needless to say, it felt really good to be doing something for the children in Cusco who did not live with their parents, but were given an opportunity to be educated, learn some basic life skills and nurture their talents. We left the Sacred Valley for our final two days of service projects in Cusco at the Albergue, a home for 22 children between the ages of 10-18. Most of them have parents who live on farms and in villages that don’t have access to schools, nor can they afford them, so they apply for their children to live at the Albergue and hope to get lucky. Most of the children have been sponsored to live here and go to school for at least 5 years. Some are fortunate enough to be educated for up to 7 years. When they leave the Albergue, they have a basic education and they have acquired some life skills in carpentry, sewing, metalwork, cooking, and gardening. Some of them will go on to become educators in their villages so that they can help their own communities. Upon arrival at the Albergue, our two teams were pumped and ready to work. One group started building the Adobe brick walls of a future classroom and the other group started sanding pre-cut logs for a fence. It was a lot of heavy lifting, muddy, dusty and tiring work, but very gratifying when we were done for the day. We could see progress and were ready to continue working the next day. The next day, our team was anxious to make more progress even though we knew the work would have to be continued and finished by future volunteers. It was satisfying to see the structure coming up, especially the log fence which we managed to get up and even paint. The younger volunteers really enjoyed the painting. It gave them an opportunity to leave a personal touch and made the fence more fun for the kids at the Albergue. We enjoyed another healthy lunch before saying goodbye to all. We even had time on the last afternoon to hit the cobblestone streets and main square in Cusco. We really enjoyed the walk, the sights, the shopping, and could not decide where to grab dinner. One of the most beautiful sights was the church at the hotel Monastario. The carvings were so intricate and the colors so vibrant. Our trip to Peru was a lot of fun. We really enjoyed all the sights. Machu Picchu was definitely a highlight, but all the service projects we worked on throughout the week were truly inspiring, fulfilling and really gave us an opportunity to interact with the local Peruvian people. They are very friendly, grateful and welcoming. We came home with a perspective we will treasure for a lifetime.